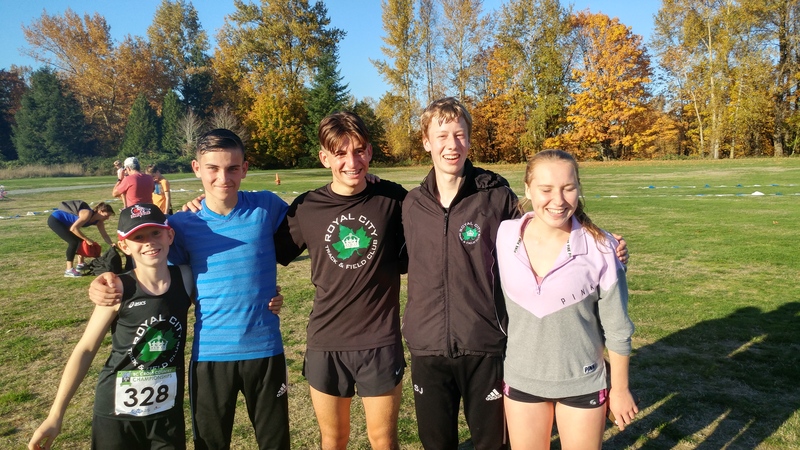 Congratulations to the RCTFC Cross Country Team for their determined performances at the BC Athletics Cross Country Championships in Abbotsford on Saturday, October 28th. As you can see from the photos, the weather was mild and actually pretty warm for XC racing standards! Congratulations to Ava Forsyth, Jackson Schiebler, Finn Janke, Ryan Perks, Ellie Yong, Ashley Ko, Max Holmes, Emily Bowles, Monika Arcadi, Katie Stewart-Barnett, Ryan Goudron, Ryan Roberts, Grace Fetherstonhaugh, Alejandro Romero, Isabella Brunoro and Shea Janke for capping off their seasons at this Provincial Championship! The team started off well with a Silver in the 9 year old race for Ava Forsyth. She battled a strong field of runners on a challenging course, staying close to the front so she could challenge for the lead. Her strong performance was hampered by a running cramp that held her to a still respectable 2nd place finish. Newcomer Jackson Schiebler, in his first outing in the xc season ran to an amazing 4th place in the 9 year old boys’ category! Other highlights included Max Holmes’ season-ending strong 1st place finish in the 11 year old boys’ race and Finn Janke’s 7th place finish for 12 year old boys. In a highly competitive 13 year old girls’ race, Emily Bowles finished in 8th place and Monika Arcadi ran strong to 9th place. Katie Stewart-Barnett’s finish that she had to battle out with her competitor led to 2nd place for 14 year old girls. While coming off a shin splint injury that kept her sidelined for most of the competitive season, Isabella Brunoro surprised with an exceptional top 8 finish on race day! After 2 XC seasons being held off of the podium at this event, Grace Fetherstonhaugh ran a dominating race to finish in 1st place in the Youth Girls’ race! Highlights in the deep field of competition in the Youth Boys’ race, included 17 year old Alejandro Romero’s 12th place and 16 year old Shea Janke’s 23rd/top 8 in his age-group.